A couple of weeks ago, I lauded the new book by Jean Dreze and Amartya Sen for its clear identification of a challenge book for India. 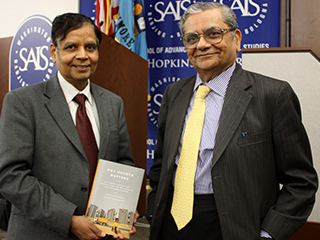 I just finished reading the recent book by their “competitors,” Jagdish Bhagwati and Arvind Panagariya, titled India’s Tryst with Destiny: Debunking myths that undermine progress and addressing new challenges. To be chronologically correct, I should have read them in the reverse order, but I don’t think it made much of a difference from a content perspective! Bhagwati & Panagariya Have Strong Views…. As has been written extensively in the press, Bhagwati and Panagariya are emphatic that India’s number one priority should be making all possible efforts to sustain economic growth. 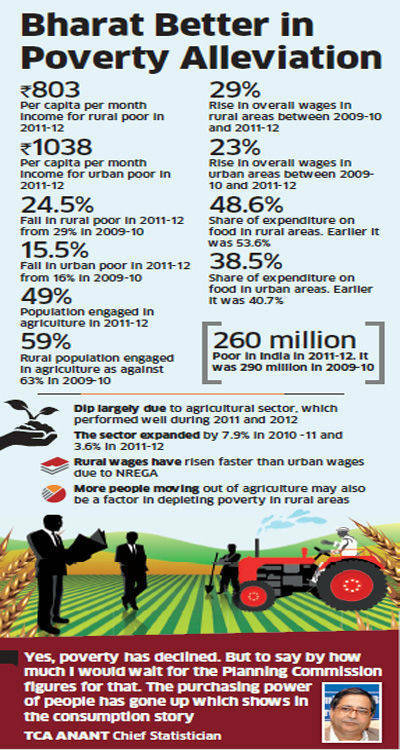 They argue that India’s poor has benefited from sustained economic growth, and provide evidence that this holds true even for people from socially and economically disadvantaged groups. 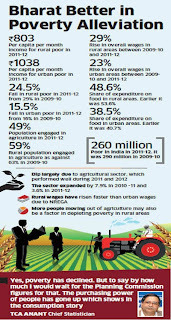 Though India has, thanks to the growth in the last two decades, more money to spend on the provision of social (health, education) services, they point out that we lack sufficient resources to provide the kind of welfare services that the UPA (more specifically, the NAC) wishes to. Even if we are to do much more for the poor, Bhagwati and Panagariya are completely against the government playing the role of provider. Instead, they prefer that the poor be assisted through cash transfers (for food security), insurance mechanisms (for health), and vouchers (for school education) on the grounds that these will be better aligned with market mechanisms, involve less corruption, and achieve better results. A few things struck me while reading this book. One is the aggressive tone of the authors, combined with a knowledgeable air that suggests that these issues are so obvious that anyone who thinks otherwise must be living in a world of delusion. They are almost disrespectful to Dreze and Sen when they refer to arguments that the latter have made in the past which conflict with their own. This aggressive tone is related to the second feature of this book: a strong conservative ideological slant – small government, minimum regulation, and worship of the market. A combination of one and two results in their unapologetic air about the growing incidence of billionaires in India. Here, they unfortunately fail to differentiate between those who made their billions from knowledge-based companies, and those who did so thanks to privileged access to scarce resources. I was surprised to find their endorsement of some unsustainable distortions in the education system. One of their findings is that private, unrecognized schools provide better education than government schools, even though the teachers in the former are paid several times less than the latter, because of better supervision and oversight. But, from all reports, teachers in such private schools are under-paid and over-exploited, and the schools themselves have poor infrastructure including no playing or recreational space. This may be an economically “efficient” solution, but surely it can’t be the basis for building a modern productive workforce. It must be obvious by now that I liked the Dreze-Sen book better! For one, it has a scholarly and more even-handed tone. Dreze & Sen don’t dismiss growth (as Bhagwati and Panagariya might lead you to believe), they just suggest that it’s a real shame that a country with our resources can’t do better for its citizens. Dreze and Sen provide a broader perspective of development (not surprising considering that’s Sen’s forte) while Bhagwati and Panagariya take a mechanistic view and look at people with the lens of the “economic man.” Perhaps Dreze and Sen are a tad more idealistic and romantic than Bhagwati and Panagariya, but surely a country with our history and potential needs to retain a dose of idealism. I liked Panagariya’s earlier book (India: The Emerging Giant, 2008) but this one has an impatient, “angry man” air about it that detracts from its core arguments. As I wrote in my earlier post, a particularly attractive dimension of the Dreze-Sen book is their openness to different models, and a willingness to learn from “bright spots.” On the other hand, Bhagwati and Panagariya are dismissive of such bright spots that don’t fit in with their ideology. This suggests to me that Bhagwati and Panagariya are much less open to innovation and trying out new things. In fact, they take a very explicit classical economics view of capitalism and labour as the main inputs to the production function, taking us back to a time before Solow when technological change was no more than a residual explanation of growth. I am glad that our government takes a more modern view of change, and is explicitly trying to encourage innovation to solve social problems (Both the National Innovation Council and the India Inclusive Innovation Fund have this focus). But, to be fair, neither Dreze & Sen nor Bhagwati & Panagariya appear to have understood the tremendous potential of technology to reform health and education. Their discussion about both assumes standard, people-intensive solutions for which issues of accountability and control are obviously important. But, as is increasingly clear (see my posts on Massively Open Online Courses [MOOCs ] and new models for inclusive healthcare), new models are emerging which may make their ideological differences less relevant. Creative use of MOOCs could allow us to achieve higher quality teaching with a far lower number of teachers. The role of the teacher would also change from being the source of knowledge to being a facilitator of learning. Organizational issues related to who is the employer therefore become less important. Similarly, initiatives like Sughavazhvu Health care show that with the use of improved technology, and a stronger preventive healthcare orientation, it is possible for alternately trained personnel to take care of primary health care. Here again it doesn’t need to be a choice between poorly managed government-run public health centres (as Bhagwati and Panagariya would characterize them) and exploitative private doctors (as Dreze and Sen would call them). Government’s role and priorities would be different under such alternate paradigms. In education, the role of government would shift to making available low-cost, high speed broadband internet connections to students along with a low-cost access device, and in providing financial support for the creation of high quality content in regional languages. In healthcare, the government’s role would be in re-establishing a focus on public health, setting standards for certification of medical health professionals who are not doctors and providing a communication backbone that would allow the low cost use of technology in primary health care. In their eagerness to prove the superiority of their respective positions, leading economists are in danger of missing out on the power of innovation, the ability to bring fresh thinking to the solution of tough problems. Perhaps we need greater openness to new ideas, and a healthy pragmatism instead?